At Metropolitan, we can supply all equipment needed to keep your pump system functioning as efficient as possible. Our adaptability and knowledge of new technologies give us the ability to supply the most cutting-edge equipment, which can extend the life of a system, save end users funds and make maintenance easier than ever before. A premier example of this technology is demonstrated by the work done at a large commercial building located in Lake County, Ill. At the request of the owner, the building name and location will remain confidential. Metropolitan completed a retrofit application in which a total of eight self-priming sewage and sump pump systems were installed to replace aging equipment that was over 25 years old. Metropolitan was the supplier and designer of the retrofit project, crossing over the old style of pumps with the new of style pumps. Swanson said Metropolitan was contacted at the project’s inception at the end of 2010 and that pumps officially went into operation in August of 2011. Swanson said the systems were built and shipped to the job site at once, accommodating the customer’s installation date request and ultimately assisting in the installation process. Among the many improvements the new model 35-45 MPC provides in comparison to older models, Swanson named a few in particular that were illustrated in this project. Swanson said the systems were installed in a number of locations at the facility. An interesting aspect of the project was the utilization of stainless steel basin covers for systems installed in the facility’s parking garage pump rooms. In all, the customer made the choice to conduct a retrofit upgrade due to the advancements the new model provides. Are Your Storm and Sewage Water Removal Capabilities In Need of an Upgrade? Learn more about how our self-priming pump systems can vastly improve storm and sewage water management for your infrastructure. In addition to the equipment we supplied to the Joe Orr Road Lift Stations of Chicago Heights, Ill., Metropolitan was also chosen to supply equipment to the 71st Street Stormwater Pump Station in Bridgeview, Ill. The control and power distribution equipment was housed in a prefabricated concrete building with outside dimensions of 10’6” in length and 10’4” in width. The addition of variable frequency drives will provide the pump station with efficient operation, which will lead to energy savings for the customer. Three Hydromatic model S12L4000 non-clog pumps with 100’ cords and silicon carbide seals were supplied. Each pump has a capacity of 3142 GPM at 29.2’ TDH for a total pumping capacity of 9,426 GPM when operating in parallel. Each motor is rated at 40 HP, 1150 RPM, 460 volts, 60 Hz and three phase. A 125 kW natural gas, sound attenuated Caterpillar generator was also included in the equipment package. Metropolitan’s Keith Girup said Metropolitan was contacted to take part in the project at its inception, and that the eventual place where the building would be placed and function had much to do with its overall design. Girup said additions of variable frequency drives and enhanced controls with SCADA components will provide the municipality with both energy efficient operation and alarm notification if procedure encounters a malfunction. Control upgrades were made at Metropolitan and the building was shipped fully assembled and ready for installation. For more information, please contact Keith Girup at 815-886-9200, ext. 264 or sales@metropolitanind.com. The Merchandise Mart located in Chicago. When the world-renowned Merchandise Mart in Chicago began the task of obtaining LEED-EB certification, it was just the fifth building in Chicago to go “Green”. Adhering to standards set forth by the LEED Green Building Rating System, a voluntary, consensus-based national standard for developing high-performance, sustainable buildings. The Merchandise Mart focused on five key areas of green building strategy: sustainable sites, water efficiency, energy efficiency, materials/resources and indoor environmental quality as set forth by LEED. Such on-going improvements involved reevaluation of capital programs for replacement of windows, roofs, controls, plumbing fixtures, utility meters and lighting. To better target energy efficiency, just one of the many strategies directed by Merchandise Mart’s Vice President of Engineering Mark J Bettin, P.E. was replacing an outdated domestic water supply system that was a large consumer of energy and an inefficient supplier of water. The original system consisted of five pumps ranging in size from 40 hp to 75 hp. The pumps ran at a constant speed intended for the highest demands even during low-flow periods such as during the middle of the night. The system was designed to deliver over 1250 gpm, churned at 290psig, and incorporated pressure reducing valves on the discharge of each pump to maintain a system pressure at 200psig. The five original pumps were oversized by 35HP each, totaling 175 unnecessary horses. “With recent restroom renovations complete, the water consumption and demand reduced annually by over 35%, resulting in an oversized, inefficient pumping system. It required large amounts of energy to run and replacing it would help in the buildings’ on going energy reduction efforts and contribute in maintaining the standards of LEED certification,” Bettin said. According to Merchandise Mart’s Plumbing Foreman, John Geiss, prior to the retro-fit and during heavy usage the domestic water system would see momentary swings in the system as much as 40-PSI at the top end of the system, resulting in noticeable fluctuations at the fixtures and excessive pipe movement. ss locations. Encompassing 4.2 million gross square feet, The Mart spans two city blocks and stands 25 stories high. Today, The Merchandise Mart welcomes more than three million visitors each year to its retail shops, boutiques, 11 floors of permanent showrooms for gift, residential, casual and contract furnishings, 10 floors of office space, dozens of trade shows and a myriad of special educational, community and consumer events. During peak flows, which typically are during a large tradeshow event or during the workweek, demand can reach 750 gallons a minute when up to 20,000 people populate the building during major exhibitions. However, during low flows, as witnessed during the early morning hours, demand can slow to a few gallons a minute. With such a wide range of flows and given the Merchandise Mart’s demanding show schedule where water consumption constantly changes, the new domestic water system would need to match not only extremely high flow demands but also the low flow demands using the least amount of energy necessary. During the bidding process, quality, service and experience were the criteria important to Bettin when choosing the companies to complete the work. “We pre-qualified the companies such as engineer KGWW, Metropolitan Industries, Inc., Great Lakes Plumbing and Blaze Electric based on their experience and reputation,” he said. Chicago-based Great Lakes Plumbing was awarded the design/build contract based on the proposal they submitted. Great Lakes’ Bob DeGuiseppe, project manager, served as the general plumbing contractor and pump and control system manufacturer Metropolitan Industries, Inc. of Romeoville, Ill., designed the new system and pressure reducing zone stations while Blaze Electric of Broadview, Ill. served as the installing electrical contractor and KJWW of Chicago served as Engineer during the project. Metropolitan’s design of the pump system and pressure reducing zone stations was based on two specific goals that included reducing energy costs on day one of start-up; and ensuring enough redundancy to prevent loss of service in the future due to power or mechanical issues. Working closely with DeGuiseppe, Metropolitan Chicago Sales Manger, Mike Ponx suggested installing a variable-speed system that would reduce energy costs by half due to the system’s ability to precisely match demand using only the minimal amount of energy necessary. The system supplied was a variable speed, quadraplex booster system using vertical, multi-stage pumps, total system rated at 1000GPM at 200 PSI. The Merchandise Mart’s peak flows are 750 gallons/minute so in a condition where any single pump fails, the system will still be able to handle the load without shut down. To add to the redundancy, there are two separate power feeds divided between the system. Feed A runs three pumps and Feed B runs two pumps. If either feed A or feed B is lost, the building will still have one electrical feed to supply water to the building without interruption or system shutdown. The electrical control system and plumbing design was also configured to one existing pump to operate as a manual stand-by pump to further add redundancy to the building. The building is divided into four zones to stabilize pressure. At each zone, pressure reducing valves were downsized to maintain each of the zone’s pressure requirements and the four bladder tanks were installed on the 6’’ cold water express risers to sustain pressure when the system shuts off during low flow periods. Using bladder tanks at the top of the express riser, pressure is stored so the system can shut off during low flow periods. As flow is consumed the pump system will activate and supply water to the building at the desired pressure. Once the demand for water is reduced to a low flow period, the system will shut off once again. Significant energy savings is realized during low flow periods when using variable speed drives and bladder tanks in combination. During installation of the pumps and controls, interruption of service did not occur to the building said DeGuiseppe. “Since the existing booster system had two independent electrical feeds and the building could not be without water at any time, the electrical controls were built into two sections, which would be mated together during the second phase, he said. DeGuiseppe spilt the new control panel into two sections, Blaze Electric installed the main control section first after disconnecting the first electrical feed, than installed the first two of four pumps using the new controls. Once the first two new pumps were online Blaze Electric removed the old panel and installed the second half of the new control panel, which was designed to mate up to the first section. After that, the remaining two pumps were installed. The energy savings realized using a variable speed booster system are tremendous. In order to commission the system and measure the savings, meters were installed to measure flow and energy consumption. Results appeared quickly with the installation of the first two pumps. Energy reductions in the first week were 34%. With completion of all the pumps, the bladder tanks came on line and the system was set for commissioning. Utilizing a system by-pass and real-time flow meter, various loads were created to allow for fine tuning of the drives and staging of pumps. With the removal of the top zone PRV, the system pressure was successfully lowered from 200 to 185. Taking advantage of the bladder tanks, the night-time mode was enabled resulting in the cycling of pumps. Week after week evaluation has shown a reduction in energy by up to 50% with an anticipated annual energy reduction of over 125,000 kwh. Within a decade, the system will pay for itself entirely on energy-savings and the expected life of this system is over 25-30 years so eventually the system will not only pay the end-user for the cost of the system but it will also pay the costs to replace itself in its lifetime! 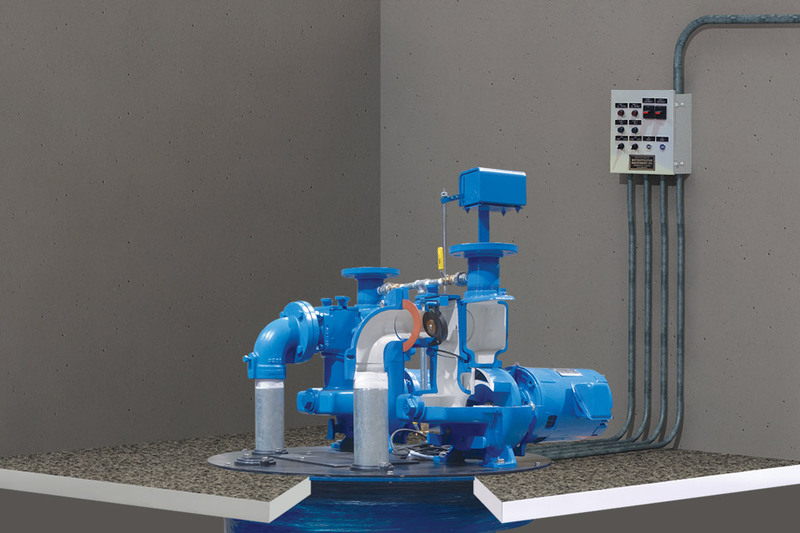 According to Geiss, the completion of the retro-fit work improved the overall performance of the system by lowering working pressure and reducing fluctuations throughout the system. “For the first time we have experienced the most even flow and the best overall PSI performance at the top of the 10th, 18th and 25th floor zones,” he said. This was accomplished by reducing the size of the valves in the respective zones to “tighten,” up the flow in conjunction to the smooth operation of the variable speed booster system and bladder tanks that feed and assist the entire system as a whole. “Overall Metropolitan and all parties involved came through with the promise and commitment to a 2-4 psi swing, and an energy savings that will match the Merchandise Mart’s committed effort to LEED providing for a GREENER tomorrow,” said Geiss. According to the U.S. Dept. of Labor, many workplaces contain spaces considered “confined” because their configurations hinder the activities of employees who must enter, work in, and exit them. A confined space has limited or restricted means for entry or exit, and it is not designed for continuous employee occupancy. Confined spaces include, but are not limited to underground vaults, tanks, storage bins, such as those used in wastewater pumping applications. OSHA uses the term “permit-required confined space,” to describe a confined space that has one or more of the following characteristics: contains or has the potential to contain a hazardous atmosphere; contains a material that has the potential to engulf an entrant; has walls that converge inward or floors that slope downward and taper into a smaller area which could trap or asphyxiate an entrant; or contains any other recognized safety or health hazard, such as unguarded machinery, exposed live wires, or heat stress. Not only is it dangerous to operate in a confined space, but it is also costly and time consuming for municipalities to maintain according to Metropolitan Industries Service Manager Mike Schiazzano. He says a permitted confined space needs a minimum three-man crew with the following safety gear; two multi function gas monitors, tripod with safety retrieval line, safety harness, a fresh air blower, a fresh air tank with airline, respirator and escape pack. Training the crew to use all safety gear along with the retrieval equipment procedures is also an added requirement. He adds by eliminating the need to enter or work in a confined space a municipality can save time and money. Above-grade applications eliminate the danger, costs and manpower issues associated with confined space applications. Installations typically consist of a small control and generator building installed next to wells below grade containing pumps. The pumps are easily accessible and can be easily removed and installed without entering well using guide rails. Above Grade Stations Eliminate Confined Space Entry. Costs and labor to maintain such an installation are minimal. Given that it is above grade and anything below grade is accessible from above, typically one person can operate the entire station reducing operating costs. Also further reducing cost is the elimination of the equipment and safety apparatuses associated with confined space entry. Metropolitan Industries, Inc. specializes in the design and manufacture of above grade, lift station/control packages and recently completed two such jobs in Merrillville, Ind. that eliminated previous confined space applications. Working with Robinson Engineering and Contractor Hasse Construction, Metropolitan Industries, Inc. supplied a triplex, component lift station complete with a prefabricated building that houses the controls, valves and generator. The triplex concrete lift station uses three, 50 HP, rated for a total 1442 gallons per minute (GPM) at 89.2 feet of total dynamic head (TDH). One submersible level transducer and four level switches control on, off, override and alarm levels in side the basin. Access hatches, a pump removal lift out system and guide rails allow easy access to pumps for maintenance without having to enter the 32’ basin. To eliminate confined space entry, all controls, valves and a back up generator were housed in a prefabricated building measuring 19’ 3’’ long by 13’ 6’’ wide by 11’ tall building. The building itself was divided into two sections, one side for the controls and valves and the other side dedicated to just the generator. On the control/valve side of the building, a triplex control panel with programmable logic controller and touch screen operator interface controls the system. The discharge pipe and valve assembly are located above grade inside the building for easy access. The generator side of the building houses a Caterpillar 125kW, 3-Phase natural gas generator complete with accessories. A 400 amp automatic transfer switch allows for transfer to the generator during power outages. Other features of the building include an HVAC system for climate control, high water alarm with dialer and battery back up, lighting and smoke detectors. The John Wood School Lift Station is another example of an above-ground application that eliminates confined space applications. This application called for a duplex component lift station again with a prefabricated control, valve and generator building. The duplex concrete lift station uses two 40HP submersible pumps, rated for a total 700 GPM at 113’ TDH. One submersible level transducer and four level switches control on, off, override and alarm levels in side the basin. Two lift-out hydraulic sealing flange assemblies allow pump removal for maintenance and repair without entering the sump. Just as the last example, all controls, valves and a back up generator were housed in a prefabricated building but this one measured 18’ long by 13’ 6’’ wide by 9’ tall. The building as well was divided into two sections, one side for the variable speed controls and valves and the other side dedicated to just the natural gas Caterpillar generator inside. Other feature of the building include an HVAC system for climate control, high water alarm with dialer and battery back up, lighting and smoke detectors. Above grade applications eliminate the dangers and costs associated with confined space procedures. Towns and villages save money by eliminating the special safety gear and reducing the personnel required by OSHA on a service call. Municipalities will save time by eliminating the requirement of obtaining a “confined space permit” that designates what is to be done, when and by whom. No longer will the local fire and police departments need to be involved as sometimes the permits dictate. As demonstrated a “permitted confined space” requires special handling, equipment and a fair amount of extra time and work if all the rules are followed. Eliminate these hurdles with an above grade application.